A few months ago, the Organisation of Professional Associations (OPA) with its total membership of approximately 50,000 professionals issued a unanimous statement rejecting the 13th Amendment (the 13th A). The 13th A, we should recall was imposed on Sri Lanka by Indian gunboats and the threat of an invasion. 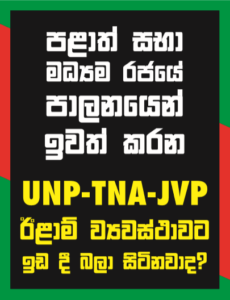 Unless it’s a mistake or purposely done the UN removal of Sri Lanka from its List of Shame for child conscription does not clearly distinguish the fact that it was the LTTE that conscripted children to its terror outfit and not Sri Lanka’s army. Your expression of sympathy, in your letter to Prime Minister David Cameron, with the thousands of your Tamil constituents who have been indirectly affected by the “atrocities” committed by the Sri Lankan military in the closing stages of the war against the most vicious terrorist outfit in 2009 raises some pertinent questions (The Island, Sri Lanka, 7 Jan 2013).